Note: High resolution jpegs (300 dpi) of manatee images or the Club’s public awareness materials are available upon request. Save the Manatee Club’s mission is about saving lives. With a record-breaking year for manatee watercraft mortalities, the Club reminds the public of its free boating banners, signs, posters, decals, and other materials available to increase boater awareness and help keep manatees safe. Manatees are Florida’s official state marine mammal, treasured by Floridians and visitors in the United States and from around the world. 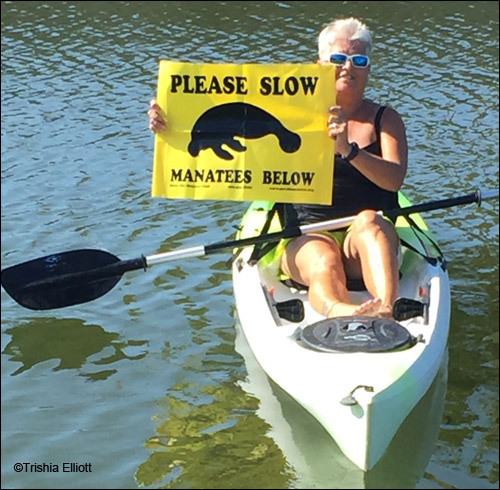 Avid kayaker Mary Atella in southern Sarasota County, Florida, requested Save the Manatee Club’s free yellow waterproof boating banner with a message that reads, “Please Slow, Manatees Below.” Displaying the brightly-colored banner helps to quickly alert boaters when manatees are sighted. Scores of manatees are killed each year from collisions with boats, and many more are injured and bear scars from boat propellers. Mary explained how saddened she was by the number of manatees and dolphins she has seen with deep scars due to boating incidents. “I will continue to help make others aware of the precautions that need to be taken while enjoying water sports to ensure these gentle giants and other wildlife are not harmed,” Mary said. The Club also provides shoreline property owners with aluminum dock signs to alert boaters to the presence of manatees in the area as well as weatherproof boat decals with the number for reporting injured, orphaned, or harassed manatees. In conjunction with the Florida Fish and Wildlife Conservation Commission, Save the Manatee Club produces laminated waterway cards which feature boating speed zones on one side, and tips for spotting and protecting manatees on the other. The card information is also translated into French, Spanish, and German. And the Club produces a family-friendly outdoor sign to help stop manatee harassment. The signs are distributed to state, municipal, and county parks; marinas; and other sites where human/manatee interaction can be a problem. Save the Manatee Club was established in 1981 by singer/songwriter Jimmy Buffett and former U.S. Senator and Florida Governor, Bob Graham, to protect manatees and their aquatic habitat for future generations. In order to achieve its mission, the Club, which is a nonprofit grassroots action organization, promotes public awareness and education; sponsors scientific research, and rescue, rehabilitation, and release efforts; and advocates for the conservation of manatees and their essential habitat based on the best available scientific data. Send requests for the Club’s free waterway signage and boater banners via email to education@savethemanatee.org or by calling toll free at 1-800-432-JOIN (5646).